“You are gifted with virtually unlimited potential for learning and creativity,” said author Michael Gelb. In a keynote presentation at Singularity University’s Exponential Medicine Summit in San Diego this week, Gelb shared his insights for maximizing that potential—based on lessons from one of the greatest thinkers of history, Leonardo da Vinci. Being more like da Vinci, Gelb said, can help us uncover hidden abilities, expand our minds, and accomplish more than we thought we could. Gelb used da Vinci’s notebooks, inventions, and artwork to come up with seven da Vincian principles, which he believes are the essential elements of genius. The principles are detailed in his book How to Think Like Leonardo da Vinci. Here’s the condensed version. 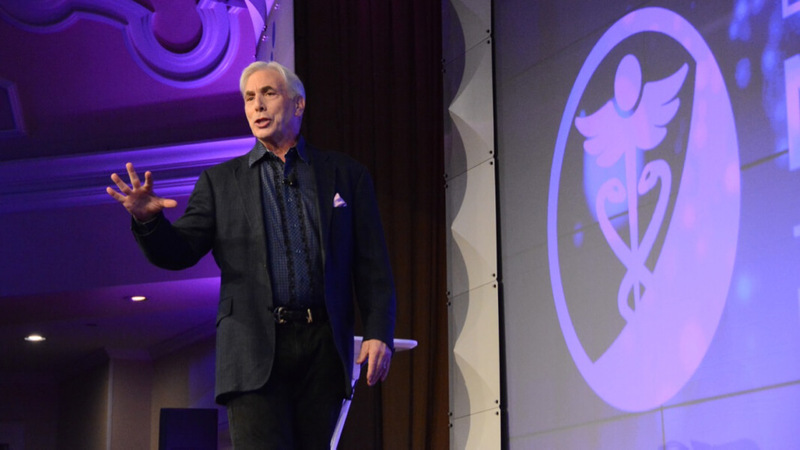 Michael J. Gelb, Pioneer in Creative Thinking and Innovation Leadership, gives a talk at Exponential Medicine. What can we all do to enliven and enrich our curiosity? Gelb asked the audience where they tend to be physically located when they get their best ideas. Some of the most common replies were in the shower, at the beach, and in the middle of the night. These are all places where we tend to be relaxed and calm. Being overly busy and stressed, on the other hand, doesn’t typically foster curiosity and creativity. Give yourself the time and space to think, wonder, and contemplate. 2. Dimonstratzione: A commitment to test knowledge through experience or demonstrate things in your own experience. Da Vinci signed his name ‘disciple of experience;’ he knew he had to be an original thinker. Back in his day and age, the biggest challenge to independent thinking was the church. “Today our challenge is too much information,” Gelb said. “How do you cut through the tsunami of spam and think for yourself?” He encouraged the audience to view the situations and challenges in their lives from different perspectives and make an effort to filter out the many distractions that surround us. 5. Arte/Scienza: Developing the balance between science and art, logic and imagination. Balancing apparent opposites gives us a more complete view of the world and allows us to think with our whole mind rather than just a portion of it. Gelb said elite scientists are highly likely to have a hobby involving arts and crafts; Nobel laureates are 2.8 times more likely to have an artistic pursuit than the average person. It’s all about balance. 6. Corporalita: The cultivation of ambidexterity, fitness, and poise. Similar to balancing the different parts of the mind, we must each balance our own body and mind in order to preserve our health. The choices we make have an effect on our wellness. 7. Connessione: A recognition and appreciation for the connectedness of all things and phenomena; “systems thinking.” Be aligned with your highest purpose, your big question. “We suffer from premature organization, which prevents conception,” Gelb said. The key to making progress on a big task, he said, is to generate first, then organize—and that means being aware of the big picture from the outset. Gelb’s—and da Vinci’s—approach to unlocking human potential is closely aligned with modern-day holistic views of health. However, that doesn’t mean we’ve become skilled at implementing this advice in our lives. We may not all end up painting the next Mona Lisa, but keeping the da Vincian principles in mind each day may help us make the most of our own unique gifts. Luckett & Liles is a people and process consultancy based in Washington, DC. We offer B2B and B2G services that reshape organizational cultures and empower personal growth.